Let’s get to the truth. Your fashion sense don’t stop with your outfits. But extends on how you carry yourself on the photos that stands as a memory for lifetime. Especially, when the craziness of Instagram and facebook are on peak, you have got to be skillful when posing for photos. You can’t afford to let yourself down in front of friends, families and other well-wishers who are watching you in all channels of social media. Today let’s talk about saree posing skills. 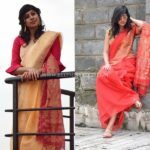 If you are that selfie loving fashion girl, you need to understand that, it is hard to cover the elegance of a saree in widely exploited close-up selfie shot. You need a helping hand or a mirror to capture the complete drape without missing any details. So if you have a friend or sibling who can take a perfect full shot, don’t do your saree photos by yourself. By all means, seek others help. If you have none around, still no worries. Find a perfect full length mirror to capture the complete elegance of your saree style. If you can’t find a big mirror, then use timer options in your mobile/camera to take the photos. Of course, the last option needs lots of patience to take a satisfying snap, but you have to do this if you want a complete picture of yours! Now comes the real question! 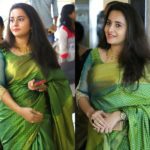 How to pose in Saree for Photos? 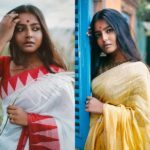 To gather ideas on perfect saree posing techniques, we checked out celebrity stylist Neeraja Kona, whose Instagram feed is full of high end celebrities in alluring saree stills. 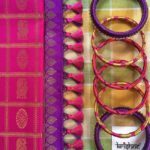 A glimpse on this stylist feed is enough to get a life time of saree posing inspirations. 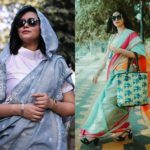 Here below, we have curated 11 dashing saree looks from the stylist profile, that’s going to improve your saree posing skills by all ways. Now scroll down to take on look on how you should pose when you wear your long drapes, and make the moment stand still for life time. Sometimes, keeping things simple can help you get the casual look you want to achieve in your photo. So if you want to look simple yet sassy, just go near a big wall or wardrobe and gracefully pose like below. A slight bend with an pleasing smile can actually set your click right. If you happen to wear dark hues, then take your photos for a stylish look by opting for beige or mild cream background. Even, black goes well with black. A black background with a bright light at the floor could completely transform your look as below. If you wear fun colors that speak well with nature like green, yellow, orange then your saree needs outdoors to get the perfect pictures. In the background, if possible, add a wooden element (chairs, tables, ..etc) to give a natural finish for your photos. Sometimes you can let the light do the magic on your photos. Especially when you wear sarees that is so opt for evening or night parties. These sarees generally have a glittery finish which when elevated with an apt lighting can dramatically look good on photos. When you go for such shots, give a mysterious look or smile to set the mood. Another way to make your saree photos interesting is to choose a background that is rich in a specific hue. Make sure the color use chose is contrasting, and also blends well with your saree. Then even your default poses can be made to look too good with such good color in the back. While there are millions of ways to pose for sarees, if you want to go for a perfect girl look, a simple sitting pose and a small smile will do the wonders. Again make sure your background compliments your saree like below. Want to look so classy in your saree photos, then simply chose a comfortable bed or couch and go for a no-eye contact look. When you want close up shots with sarees, take the below one for inspiration. Sarees that defines your structure need a creative pose to bring out the best in your photos. If you drape such saree, then go for a stylish pose like below. Make sure you have enough lightening to get the full picture. Here below is another interesting pose, if you want to look confident and daring in the photos. So if you plan to take a saree photo to bring out the real attitude in you, if you want your photo to speak for the real you, then this is the pose you need to go for. All your expensive sarees needs a best shot to bring the true beauty of them and also how you look dashing on it. In such cases, you need a close up shot that captures the details of your ensemble and also how it makes you look beautiful. Try for a pose like the one below! If you want a relaxed, comfy photo that you can forward it to your bestie to reap compliments, then you need a cool pose like the one below to make it best. Saree posing is a unique skill that can make your photos all the more memorable. Remember even the best of sarees won’t flare well in photos if you don’t chose right background or you don’t know how to carry them in photo clicks. 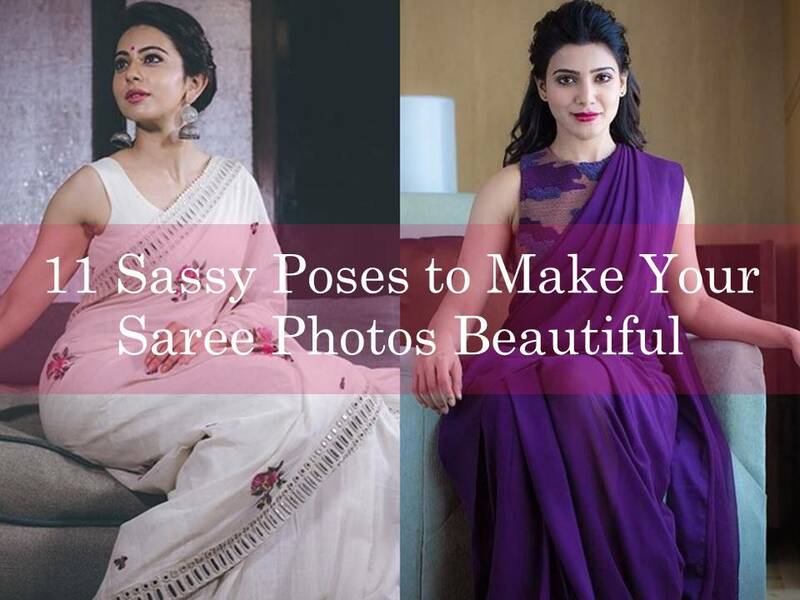 Also, instead of trying the same selfie shots and mirror shots, when you wear sarees try the refreshing looks that we have showed you in the article. 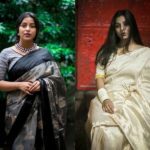 These simple posing techniques can actually help you look better in your beautiful saree photos.